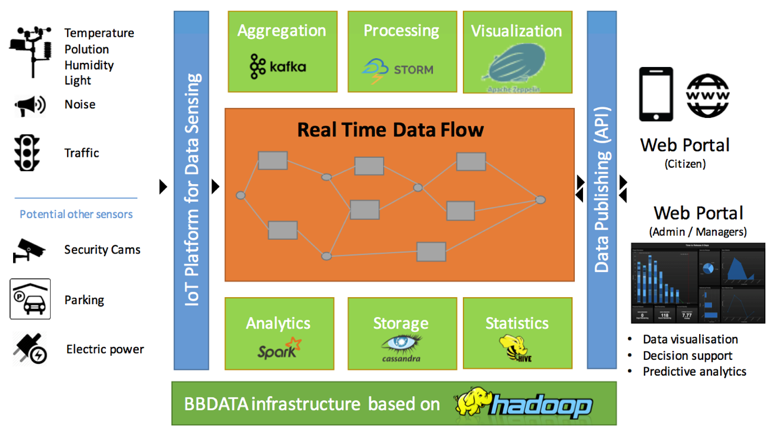 Big Data technology stacks, Sensor integration, Machine Learning techniques. Enabling Big Data technologies for city-wide environmental monitoring. Road traffic has a sizeable impact on the comfort and quality of life in our neighborhoods and cities, notably on air quality and noise pollution. The recent evolutions in sensors, communication networks and BigData analytics open new perspectives in the measurement and analysis of those impacts. The CityPulse project aims to offer a live, localized and continuous measurement of the city through the installation of a network of Internet of Things (IoT) sensors. This project is realized in collaboration with the Smart Living Lab (SLL), a long-term project which aims to develop the neighborhoods of the future. The project is driven by three institutes of the HEIA-FR, with complementary skills. iCoSys brings its experience of sensor integration, cloud infrastructures, and Big Data analytics. ENERGY brings skills in energetic efficiency, user feedback and behavior analysis. TRANSFORM is active in various urbanism and neighborhood design projects where an approach based on data capture in urban environments offers great potential. The first objective of the project is to equip the blueFACTORY site and adjacent street crossings with flexible IoT sensor platforms. These sensors will be able to infer traffic, measure air pollution, noise pollution and illumination. The second objective is to collect and process this information, enabling services to estimate quality of life indices and end-user applications for the collectivity. Finally, the data and sensor platforms will be offered to the SLL teams for their own projects through BB-DATA. This converged platform will allow the seamless usage of the data in diverse smart city use cases.